The seasonally adjusted homeownership rate remained unchanged at 65.3% during the final three months of 2012. For the year as a whole, the homeownership rate averaged approximately 65.5%–the weakest calendar year average since 1996. Homeownership rates declined across all age groups compared to the fourth quarter of 2011; however, the largest year-over-year decline occurred among households headed by a person aged between 35 and 44 years. In fact, the newest reading is down nearly two percentage points and has fallen to a new all-time recorded low of 60.4%. While all householder age groups have seen homeownership rates contract from mid-decade peaks, the overall decline registered by the 35-44 year cohort has been the largest. Indeed, the homeownership rate for this age group has plunged nearly 10 percentage points below its peak level observed in mid-2004. By comparison, the homeownership rate among households headed by a person aged 65 years and older has remained above 80% for the wide majority of quarters over the past three years. Even though the trend in homeownership among younger households is a notable downside risk for long-term housing demand should it prove difficult to reverse, the 45-54 and 55-64 cohorts will likely have a more immediate impact to the outlook. These two age groups constitute the largest blocks of homeowners and are considered key sources of “move-up” demand, trading their existing homes for newer and/or larger living spaces. The rate at which these households become homeowners versus renters will be a key variable to watch going forward. In addition to reporting the homeownership rate, the Census Bureau report provides an estimate of the vacant owner and renter housing stock. The rental vacancy rate inched slightly higher during the fourth quarter of 2012 to 8.7%, but remains 70 basis points lower compared the same period a year ago. While rental vacancies increased slightly, the homeowner vacancy rate remained steady at 1.9% to close out 2012, tying the third quarter for the lowest vacancy rate since late 2005. The Census Bureau reported the seasonally adjusted homeownership rate remained unchanged at 65.6 percent during the second quarter of 2012, hovering at a 15-year low for the 2nd consecutive quarter. The performance across household head age groups was mixed as the under 35 and 55-64 cohorts saw homeownership rates decline compared to the first quarter of 2012. By contrast, homeownership rates improved for the three remaining age groups, with the largest gain observed for householders between the ages of 35 and 44. 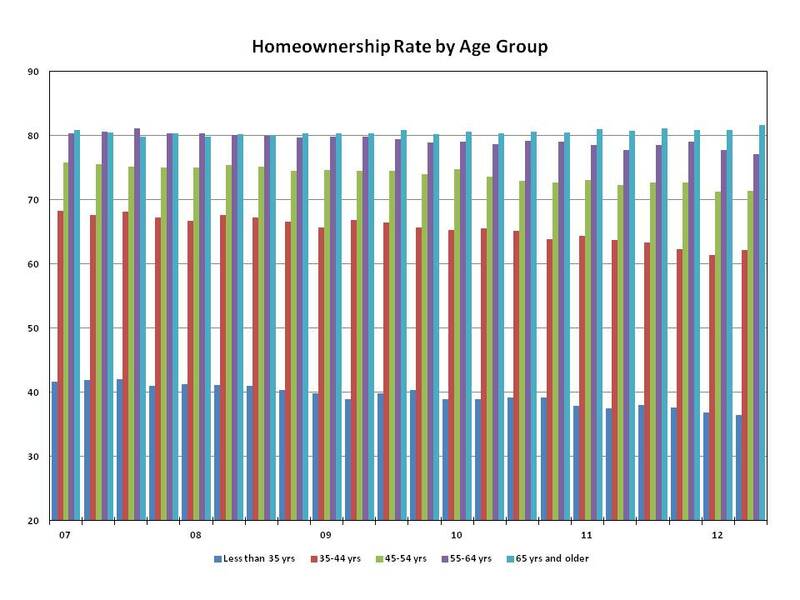 Aside from the householders aged 65 years and over, homeownership rates among the other age groups remain appreciably lower in comparison to the same period a year ago and significantly lower than their peak levels observed in the mid-2000s. The largest decline overall has been observed in the 35-44 age group, where the homeownership rate has tumbled nearly 9 percentage points. 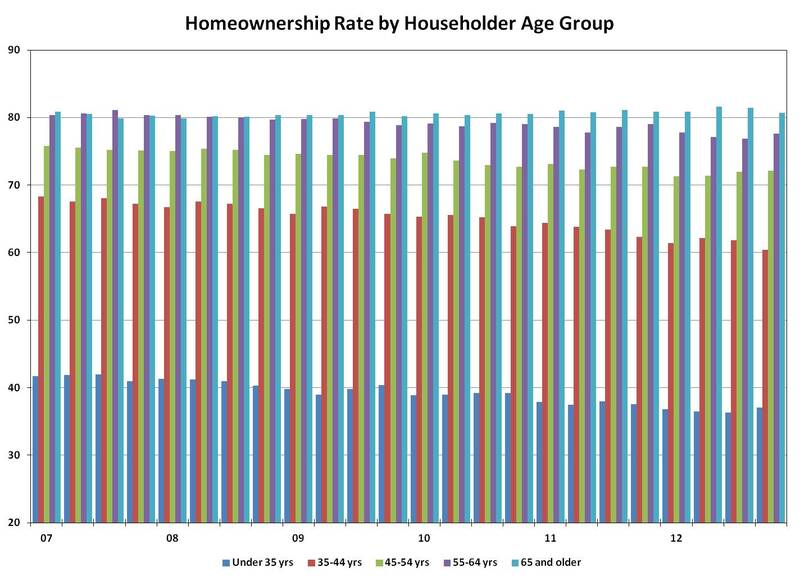 The ongoing large decline in homeownership among younger cohorts is worrisome; however, since the 45-54 and 55-64 age groups account for nearly half of all owner-occupied households combined, fluctuations in homeownership among these two age groups will likely have more visibly significant impacts on overall homeownership rates. Fortunately, as economic conditions continue to improve and members of these two older age groups begin to form new households (or re-constitute former as they move out of combined living arrangements), they should tend towards buying rather than renting. In addition to the homeownership rate, this report also examines trends in the vacant housing stock. 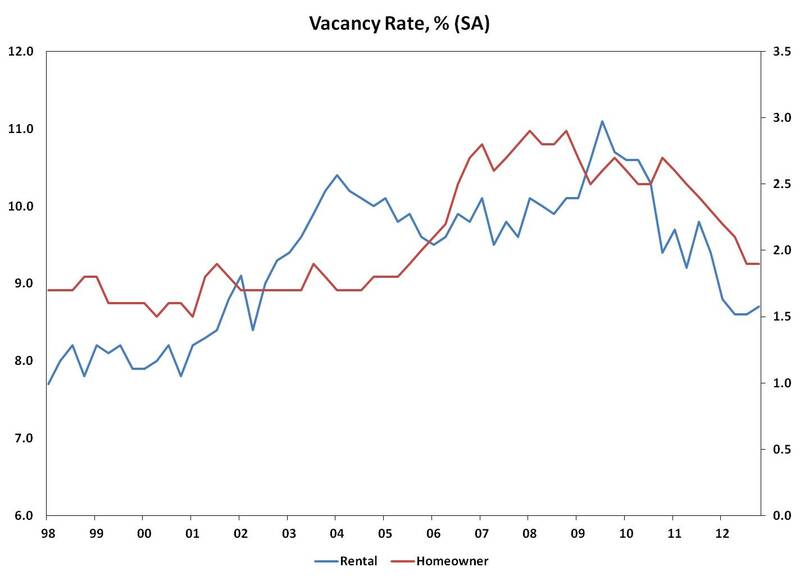 The rental vacancy rate declined for the third consecutive quarter, falling to 8.6%–the lowest reading in a decade. 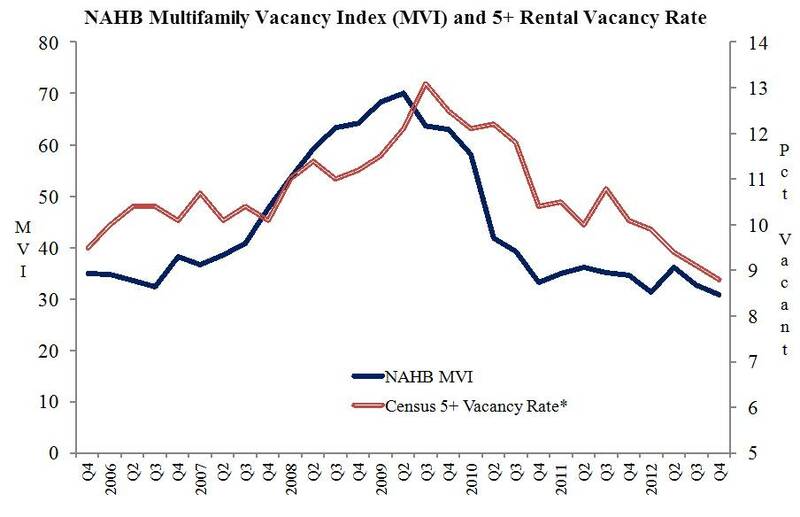 Other sources, such as NAHB’s own Multifamily Vacancy Index, reveal a similar downward trend in apartment vacancies. 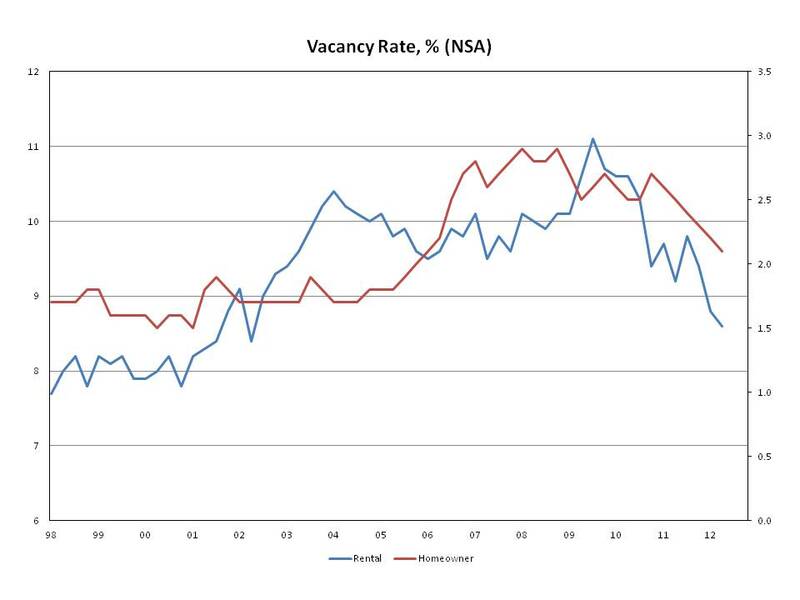 The homeowner vacancy rate has fallen steadily in each of the last six quarters, declining to a reading of 2.1%.